Still, CLOs are often compared with subprime CDOs which experienced heavy losses during the credit crisis. In our view, this is a misconception. Subprime mortgage CDOs experienced realised losses over 5-years of more than 90% in the junior tranches compared with just 2.4% and 0.9% in CLO “BB” tranches in Europe and US, according to data from Moody’s. In other words, CLOs weathered the storm. As one of the largest investors in the Nordics in both leveraged loans and CLOs, we would like to give a deeper insight in the CLO structure and why we find it an interesting asset class. CLOs are a type of CDO, which is a structured product with a pool of underlying assets. In general, CLOs are based on a pool of underlying corporate loans (“term loans” or “leveraged loans”), diversified geographically as well as on industry. 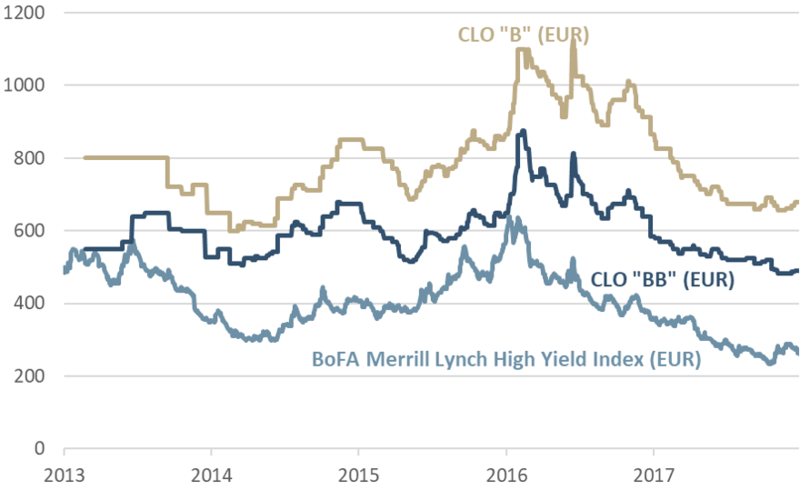 Overall, CLOs have performed well in both US and Europe, even seen through one of the worst crises in several decades. Default rates on leveraged loans peaked just above 10% in Europe in December 2009, cf. appendix 1. Source: S&P LCD, lagging 12-month and based on principal amount. However, even in the context of such severe market turmoil, CLO equity tranches (i.e. “first loss tranches”) issued in 2005-2007 have on average returned approx. 9% per annum in Europe. Furthermore, the principal losses on the debt tranches (typically from “AAA” to “B”) have, for the most part, been remote, cf. appendix 2. Source: Moody’s “Annual default study: Corporate default and recovery rates, 1920-2014” and “Impairment and loss rates of US and European CLOs: 1993-2016”. Note that the majority of “B”-rated CLOs were issued after 2014. The collateral of a CLO is primarily composed of loans to companies backed by private equity firms that have a deep interest in making sure that their company performs. The loans are sizeable, typically EUR 3-400 million or more and the companies typically have annual EBITDA of more than EUR50 million. The loans are syndicated by a group of banks and the investors are, among others, hedge funds, pension and insurance companies as well as CLO managers. In many cases, personnel from the private equity firms are actively involved in key strategic decisions involving the borrower. Structurally, CLOs are purely based on the cash-flow from the underlying loans and the payment order is fully sequential, i.e. from “AAA”, “AA”, “A” and so on and so forth. Hence, there is no mark-to-market triggers as the main focus is whether or not the cash-flow can pay the senior tranches; not whether the value of the assets have (temporarily) fallen. Even with a couple of years with very high default rates in the loan space, CLOs got through the crisis without significant losses on the most junior debt tranches. 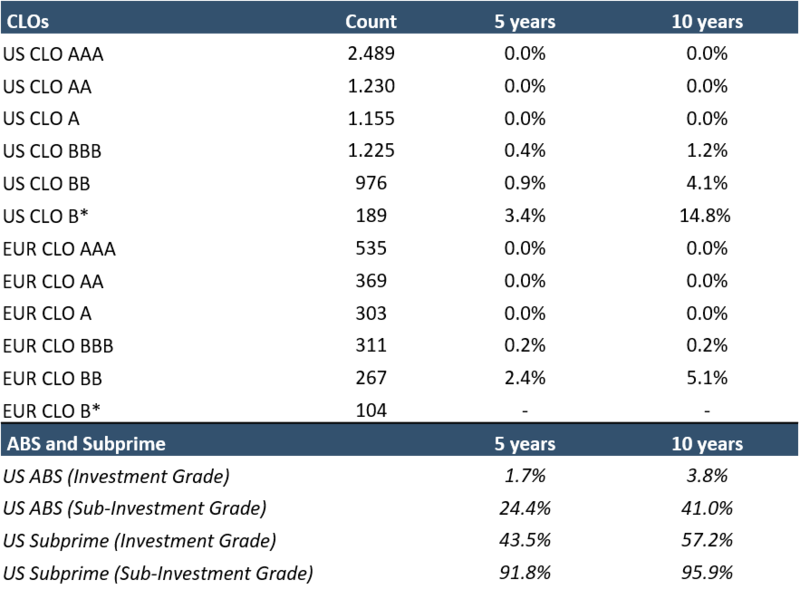 Accumulated loss rates over 5-years on European and US CLO “BB”-tranches were approx. 2.4% and 0.9%, respectively, according to Moody’s “Impairment and loss rates of US and European CLOs: 1993-2016”. This loss would in today’s market be more than fully covered with just one year’s coupon payment. Further, no “AAA”, “AA” or “A” tranches in European CLOs have experienced any principal loss since 1993. The cash-flow based structure is the main explanatory variable of why CLOs are such a robust structure. Second, the underlying assets are diversified across industries and jurisdictions. If one assume that every company across the spectrum is unable to service its debt, then losses would naturally be extremely high. In our view, though, that is highly unlikely. We are well aware, though, that the past history is not necessarily a good indicator for how the future turns out. The next crisis will not look like the last one, and it is possible that e.g. a structural change could hit leveraged loans hard. It is worth noticing, though, that the CLOs during the crisis were part of the so-called “CLO 1.0” generation, which has since morphed into “CLO 2.0” following regulatory changes on the back of the crisis. In CLO 2.0, the only eligible investment for the CLO managers is loans (and for a minor part, bonds). In CLO 1.0, the manager could invest in other structured products including ABS CDOs. Second, risk retention has been introduced as a regulatory requirement, ensuring skin in the game for the manager as well. Finally, the more senior tranches in post crisis CLOs have more subordination compared to pre-crisis. In our view, CLOs issued post-crisis are thus more investor friendly compared with the CLOs issued before 2008. This is not to say, though, that there is no risk. When the credit cycle turns (and it will, at some point) and defaults increase, CLO debt and equity tranches will naturally experience mark-to-market changes. But we feel confident that the structural features of CLOs will continue to work protecting the debt tranches, even if the default rates annually over a longer period would be above 5-6%. 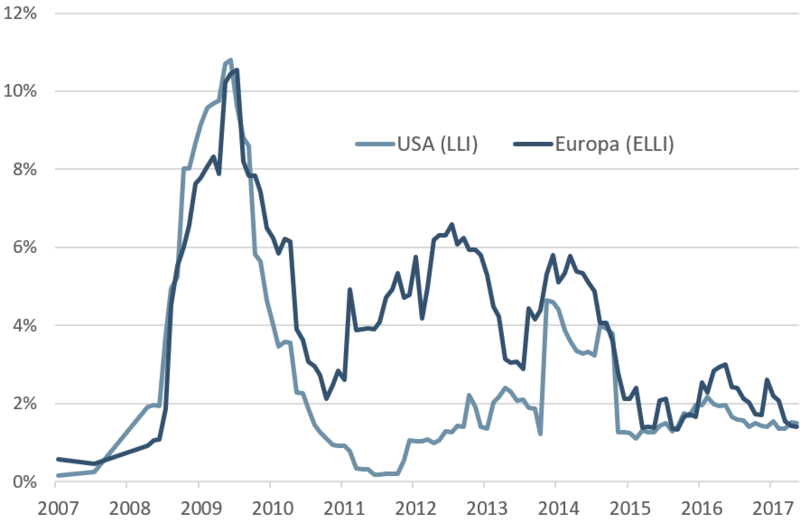 Currently, the default rate on S&P/LSTA Leveraged Loan Index (LLI, US) and S&P European Leveraged Loan Index (ELLI) is 1.5% and 1.4% respectively. One way to stress test CLOs is to assume a fixed average recovery rate (e.g. 70%) on defaulted assets and then solve for the annual default rate at which the expected yield of the bond will break zero (i.e. “breakeven default rate”). Given our assumptions, newly issued CLO “BB” and “B” tranches requires constant annual defaults rates at approx. 16% and 8%, respectively. Thus, we feel that the risk is well paid even in more junior CLO tranches, although we generally favour “BB”-tranches to “B”-tranches at the moment. It is worth noticing, that regulation on CLOs has tightened since the crisis. Current legislation ensures that CLO managers themselves invest five percent of the total value of an issued CLO (“risk retention”). Furthermore, CLO managers can only invest in loans and bonds (typically 5-10 percent), not e.g. other CLOs as was allowed before the crisis. This change from CLO 1.0 (before the crisis) and CLO 2.0 (after the crisis) is in our view a solidification of the asset class. Leveraged loans and high yield bonds are at the moment trading at post-crisis level lows. Further, leverage ratios on companies have increased to the levels seen in 2006-2007 and covenant-lite loans are in abundance. But debt-service coverage ratios, on the other hand, are significantly higher today compared with before the credit crisis. Given this, we believe that it will be more important for investors in the coming years to focus on the credit quality and the fundamentals of each issuer, compared to recent years where the move in credit spreads has been more or less one-directional (i.e. tightening). We expect default rates to increase slightly in the short-to-medium term but still to a level somewhat below the long term average of approx. 4-5% (S&P ELLI). We are well aware that the credit cycle will turn at some point. When that will happen, though, is anyone’s guess and we feel more secure to stay invested in relatively conservative and well-diversified portfolios. Further, we prefer loans over bonds in general as loans are typically senior secured versus bonds which are usually unsecured. Hence, the expected recovery rate is higher on loans than bonds. Typically, loans also have stricter covenants even though every issue seems to be covenant lite in this market. And last, loans are typically floaters versus fixed coupons on bonds which are preferred as the duration risk is lower in a market environment with increasing interest rates. A cautious and very select approach is a necessary condition when investing in Sub-Investment Grade assets, especially when being rather late in the credit cycle. Due to regulatory reasons as well as complexity and liquidity premiums, CLOs offer attractive loss-adjusted returns in several parts of the capital structure. Compared with “High Yield”-bonds, the spread on CLO “BB” and “B” is more attractive, cf. appendix 3. Source: Citi Velocity and BofA Merrill Lynch, 11th of January 2018. On top of this, High Yield bonds have a lower expected recovery in case of defaults and a fixed payment, i.e. relatively high interest rate risk (duration). Hence, we generally prefer CLOs or leveraged loans with higher expected recoveries and a floating rate payment (i.e. a low interest rate risk). Further, loans and CLOs especially add to the diversification of a portfolio, cf. appendix 4. Source: Bloomberg, Citi Velocity, S&P LCD and Accunia. Period from 2003-2017. Accunia is an asset manager specializing in private debt, high yield, and structured credit. All of our businesses are within the credit market, an area which we believe offers a competitive risk-return relationship compared to other asset classes. The core of Accunia’s investment strategy is fundamental analysis of the underlying credit risk (bottom-up approach). Our competitive advantage is to leverage our size to enable a nimble strategy within the credit markets. This strategy allows us to make swift investment decisions, not being hindered by the need to enter or exit very large positions. 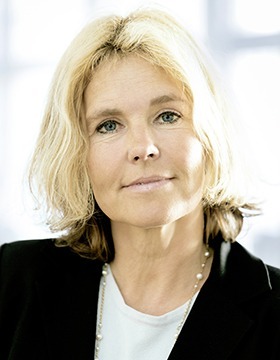 Assets under management is currently above DKK 12 billion (EUR 1.6 billion). The annualized return has been 11%* since 2009 within our discretionary mandates. Verified by Deloitte on a yearly basis. Mads has worked at Accunia for the past eight years. Previously he worked as Finance Manager and Analyst in the real estate sector working on both the financing and acquisition side. Mads holds a M.Sc. in Finance from Copenhagen Business School. 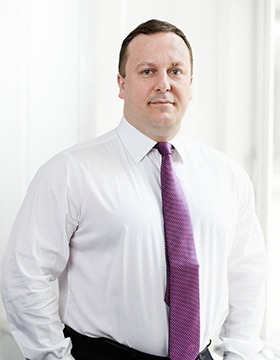 Sergio has more than 16 years of experience in leveraged finance at leading banks and 23 years in financial markets. He managed a portfolio of €25bn in Bankia Madrid, where he was responsible for trading in the credit markets and government bonds. Sergio holds a B.Sc. in Economics and Banking.